Jamaa el-Fnaa . Around the World . Attractions . Shopping . Morocco . Africa . Culture . Food . 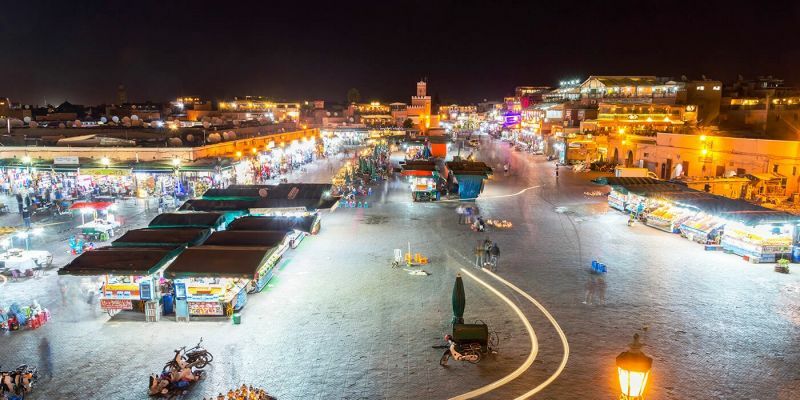 Jamaa el-Fnaa (Jemaa el Fna, Djema el-Fna, Djemaa el-Fnaa) in Morocco continues a rich tradition of sights, sounds and scents that has been ongoing since the 11th century. Acrobats, dancers, musical performers, magicians and story-tellers entertain as fortune tellers, henna tattoo artists and water-sellers in fringed hats beckon to passersby. 1- Have the Best Orange Juice Ever. 2- Binge on Street Food. 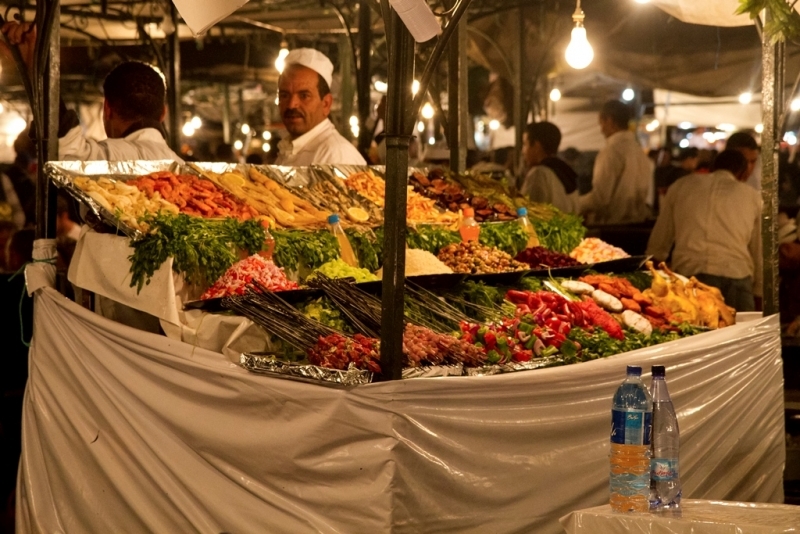 Every night, the square transforms into an exotic “food court” with stalls lit by gas lanterns, exotic aromas and ghostly columns of cooking smoke. Eat to your heart’s content: kebobs of chicken and beef, sheep’s head, snails, tagine (stew), Harira soup, cous-cous and fried aubergine (eggplant)--and so much more. Le Grand Balcon du Cafe Glacier is on the southern corner of the square. Walk through the café-restaurant with its elegantly intricate Moroccan décor, then go upstairs to the roof for a panoramic view of the square and beyond. Have a glass of mint tea or a cup of nos-nos coffee (half espresso, half milk). It’s the place to go for a hot drink at night—or a mid-afternoon ice cream! 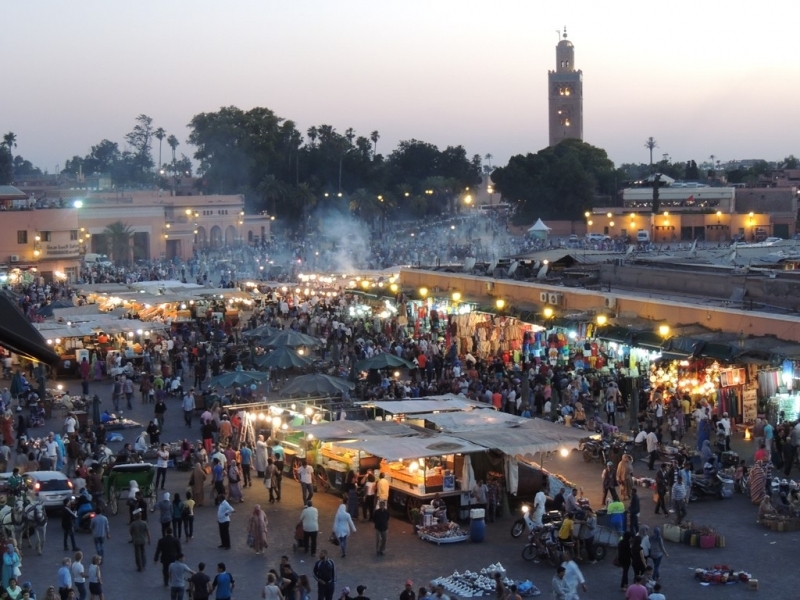 Along one side of the Jemaa el-Fnaa is the Marrakesh souk, a traditional North African market. 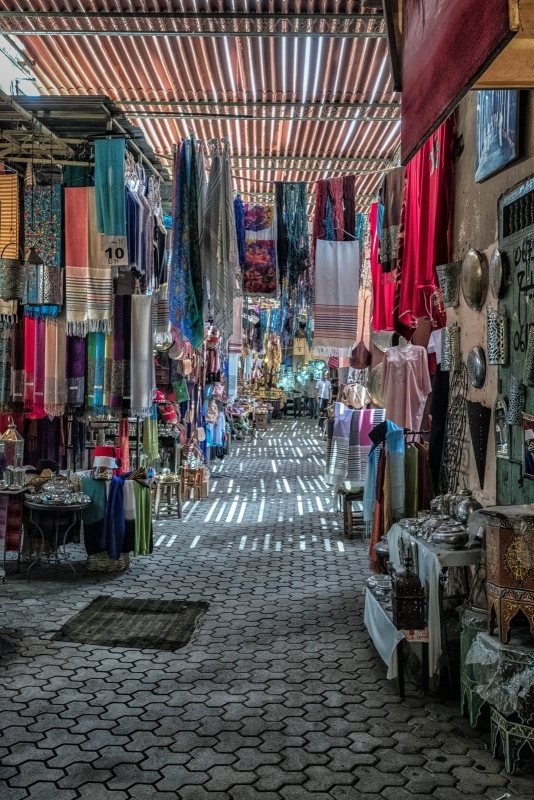 Stroll through the narrow winding streets with shops full of locally made goods, such as leather, jewelry, brightly colored pottery and glassware, shisha/hookah pipes and fabulous kaftans. Make sure you bargain—pleasantly. It’s the custom and a way to get to know the merchants. 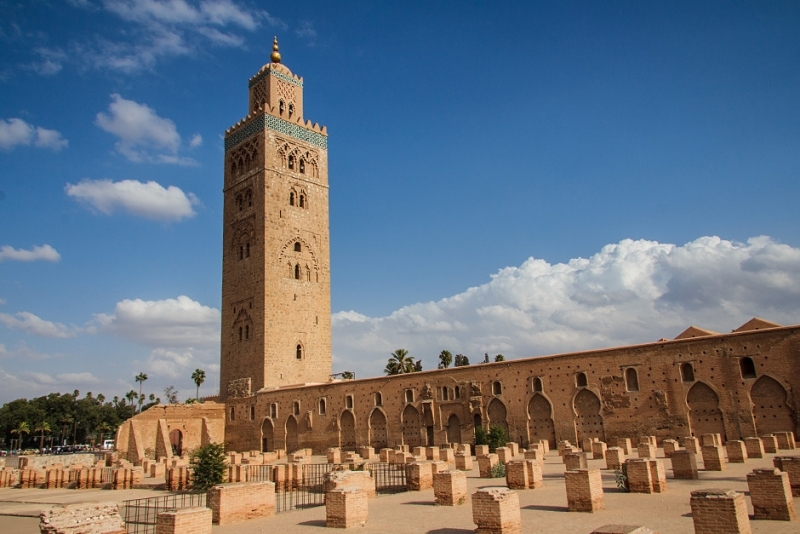 5- Visit the Koutoubia Mosque. The Koutoubia Mosque, located in the Jemaa el Fna, was built during the Hispano-Moresque period known for its simple luxury and masterful craftsmanship. The prayer hall can accommodate 25,000 worshipers, and Muslims have prayed there since 1158. Non-Muslims can enjoy the exterior of the mosque, the pink stone walls with floral motifs, from the rose garden. Have you ever wondered how local people do spend their day ? 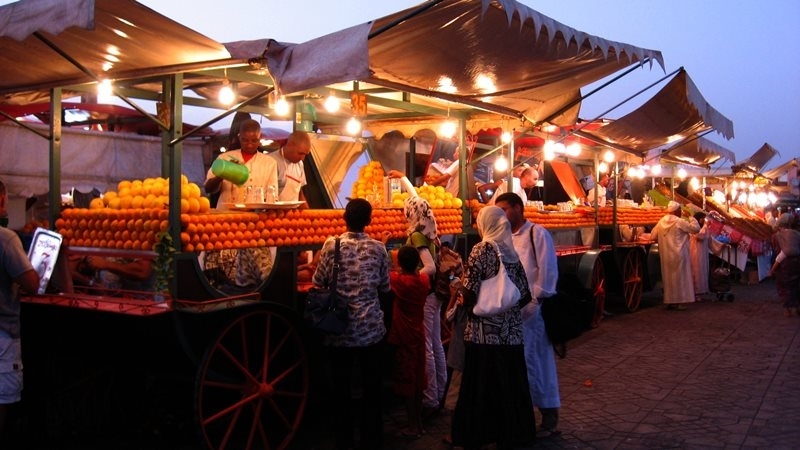 discover things to do in Marrakech through Morcco Travel Packages!